IWC has announced has just announced its entrant into the smart watch segment, IWC Connect, a smart strap attachment with an activity tracker and wireless connectivity. The Swiss watch industry continues to pile into smart watches, with the latest being IWC Connect. It’s not a smart watch, rather a small device embedded into the watch strap, giving a mechanical watch the functionality of a smart watch, just like the smart watch band from Montblanc, a sister company of IWC in the Richemont group. Familial rivalry perhaps? 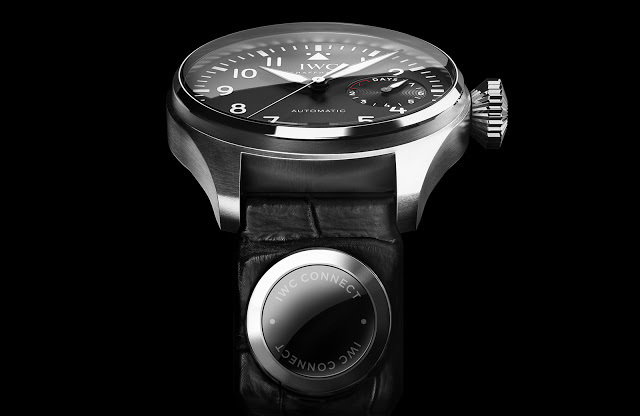 Pictured above on a Big Pilot’s watch but available on other models since it’s essentially a strap attachment, IWC Connect will offer an activity tracker as well as wireless connectivity to other devices. But in the grand tradition of high-tech watches from low tech firms, IWC announced this before details are available, proving that for publicity it’s better to be first than better, so that’s it for now. Addendum 6 May 2015: IWC also releases a brief teaser video for IWC Connect that shows the Big Pilot it’s attached to more clearly (at 0:21 of the video). And it is a Big Pilot that is not part of the current collection, most notably because of the “9” on the dial, something the current line of pilot’s watches lack. Might this be the new Big Pilot that will be unveiled at SIHH 2016?